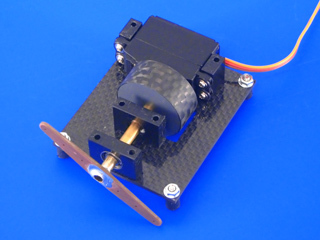 Force Servo is a new type of a servo drive for remotely controlled devices. 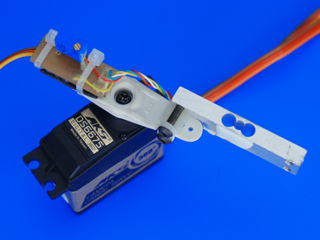 The majority of modern servo drives maintain a controlled position of the arm. Other servo drives are responsible for cyclic rotation with variable speed. Force Servo or F-Servo is a servo drive with controllable action force. The value of force is proportionate to the control signal and does not depend on the position of the arm. 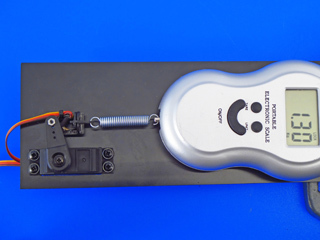 A force sensor (dynamometer) is used for controlling the force. The invention simplifies many mechanical devices where it's necessary to control the action force created by a servo drive or the action force of a mechanism controlled by a servo drive. 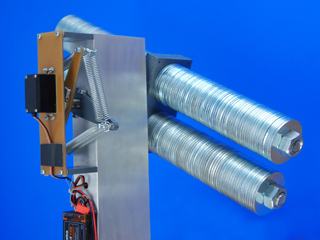 When used instead of a servo drive with a controlled position of the arm, the invention makes it possible to improve the technical characteristics of many devices and mechanisms. The key areas of application are remotely controlled light drones, robots, radio-controlled models, interactive interfaces, rotation devices for video cameras. 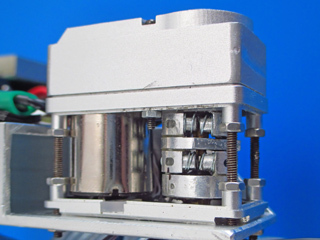 Most servo drives are rotation devices, where the term "torque" is used for defining the action force. Torque is a derivative value indicating the moment of force applied for rotating around the axis. To systemize terminology and avoid ambiguity, I prefer using the more general Force Servo or F-Servo names instead of Torque Servo. 1. High torque comparable with that of a regular servo drive. 2. Soft rotation and low mechanical noises. 3. Absence of non-linearity thanks to the feedback from the force sensor. This translates into: a) smaller size and weight, b) lower energy consumption, c) scalability and fitness for larger and heavier cameras, d) applicability for camera suspensions with a balance beam or a heavy mechanical gyroscope, e) high accuracy of the maintained position. I noted that humans control vehicles in a completely different way compared with automatic devices. For instance, if a car is resting, the driver does not know by how many turns of the steering wheel the wheels are turned in either direction. When the car is moving, the driver also doesn’t know this angle, but will turn the wheel to make the actual trajectory match the desired imaginary one. If you release the wheel, it will automatically return to the neutral position. Unlike a real driver, automatic and remote control systems always monitor the status of the steering mechanism. The majority of standard servo drives come with an integrated position sensor. Controllers set the exact steering wheel turn angle. However, it turned out that steering wheel position control is not always necessary. More than that, in some cases, automation mechanisms offer more accurate driving along a set trajectory without analyzing the position of the steering wheel. 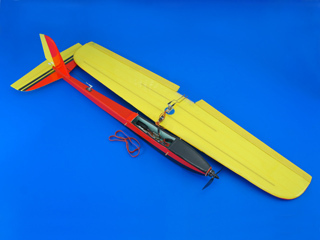 The invention was demonstrated on radio-controlled plane and ship models. In these experiments, the steering wheel position sensor was replaced with a force sensor. The essence of these modifications can be easily explained using another example. When a light piloted plane is on the ground, the steering wheel can be easily turned sideways, while the ailerons (air rudders on the wings) are in an arbitrary position. But when the air stream starts pushing on the rudders, they will assume the neutral position and so will the steering wheel. In order to turn the rudders, the pilot has to apply force to the steering wheel grip. The new type of servo drives does exactly the same and applies certain force, but does not control the exact position of the steering wheel. In order to control such a plane automatically, you only need to control the trajectory and apply force to rudders if the plane goes off course. Replacement of the position sensor with a force sensor makes for safer remote control. The reason is that a regular servo drive turns rudders by a set angle at any speed. If the speed is too high, a sudden maneuver can topple over a motor boat or destroy a plane with extra-high Gs. But the higher the speed, the more pressure is applied to air rudders  and the force sensor detects it. The new mechanism with a force sensor turns rudders more at low speeds and less at higher speeds. Therefore, it guarantees the safety of maneuvering at high speeds and improved maneuverability at low speeds. Besides, the force sensor prevents the damage of the mechanism if the rudder is jammed for any reason. Manipulators of the majority of modern robots are designed to grip objects of the same type. This means that a fragile object can be crushed and a heavy one can slip out due to the lack of pressure. 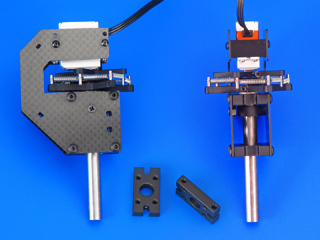 Manipulators without a force sensor grip objects of different sizes with different force. 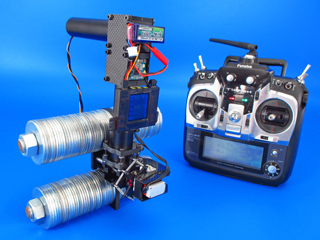 Force Servo makes it possible to control the grip force within a wider range. 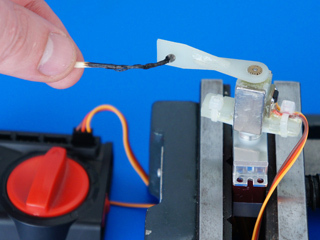 When using Force Servo, the grip force does not depend on the size of the object. The possibility of using Force Servo for controlling vehicle rudders was not discovered right away. This fact proves that new areas of application for Force Servo can be found later on. 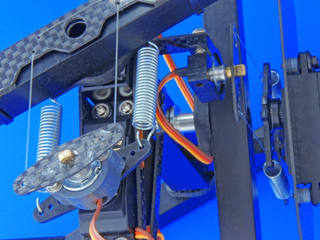 Today, controlled mechanical devices mostly use servos with internal position control. However, live organisms tend to use Force Servo's principle of operation. 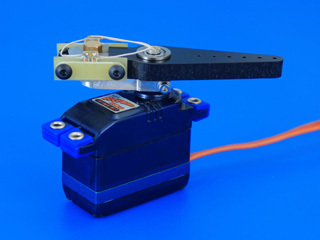 Force Servo's principle is based on using an external, not internal, position sensor. Force control prevents the device and surrounding objects from inadvertent destruction. Living organisms control their position using habitual actions, for instance, blind typing. However, if a person has to use an unfamiliar keyboard, he or she will have to look at the keys and move the finger until its "image" is positioned over the necessary key and tactile feedback reports the completion of the key press. That is why, the Force Servo principle has an advantage over the Position Servo principle in a dynamic environment (the work of Position Servo can also be adjusted using additional feedback channels, but the total margin of error will increase as well). 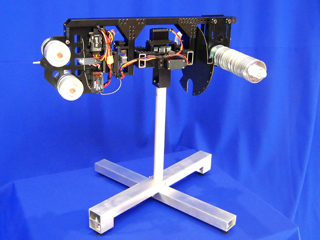 Force servo can be used in various interactive interfaces. For example it can be a joystick with an active feedback, or some other instrument, which allows to expand virtual reality on a tactile level. A servo gear with a magnetic coupling and a linear Hall sensor. A servo drive with a strain gauge sensor. A servo drive with force sensitive resistors. 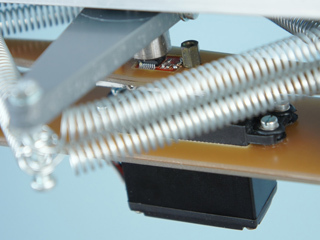 Measurement of the servo drive effect using a potentiometer during spring stretching. 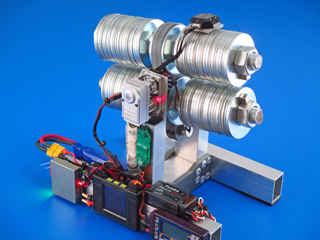 Measurement of the action force of the servo drive using a magnetic rotary encoder. Determining the action force by measuring the change of the spring's inductive resistance. The ninth prototype of F-servo with an exponential feedback. 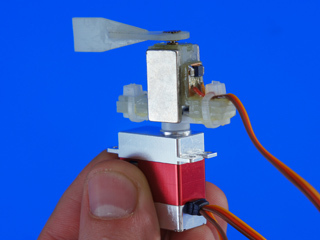 The tenth prototype of F-servo with a magnetic coupling and encoder. 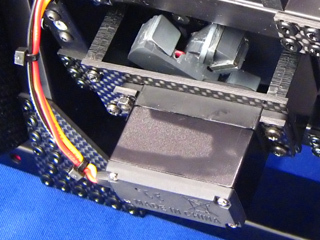 The eleventh prototype of F-servo with an extended range of controlled force values. The prototype with a pull force feedback. 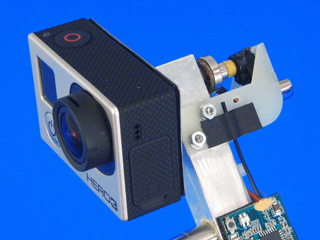 The 13th prototype of F-servo for a camera gimbal. A demo stand for rotating and stabilizing a 6 kg video camera. A demo stand for rotating and stabilizing a 11 kg video camera. 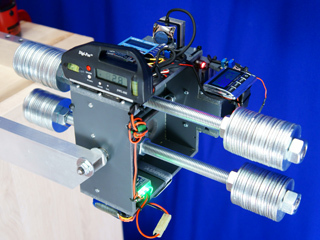 A demo stand with a standart size servo and electronic balancing assistant. 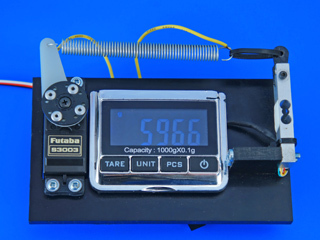 A demo stand with a micro-servo and 5kg load. 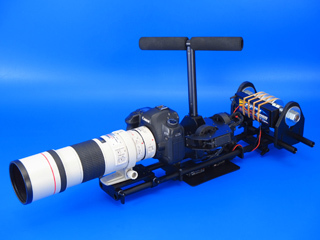 A demo stand for rotating and stabilizing a 90g video camera. 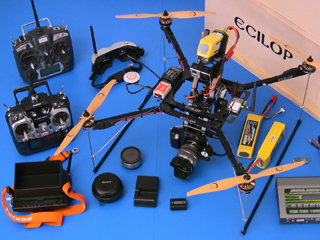 Double-axis video camera stabilization with a counterweight on an Ecilop drone. 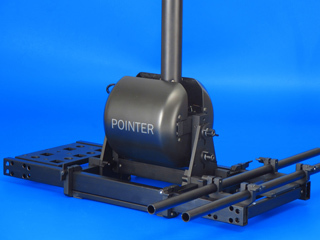 3-Axis Camera Gimbal POINTER, second prototype. Controlling ailerons on a radio-controlled plane model. 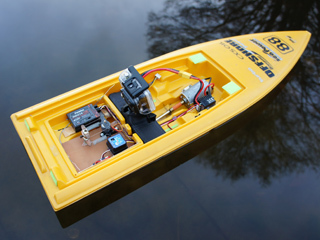 Controlling rudder on a radio-controlled boat model.